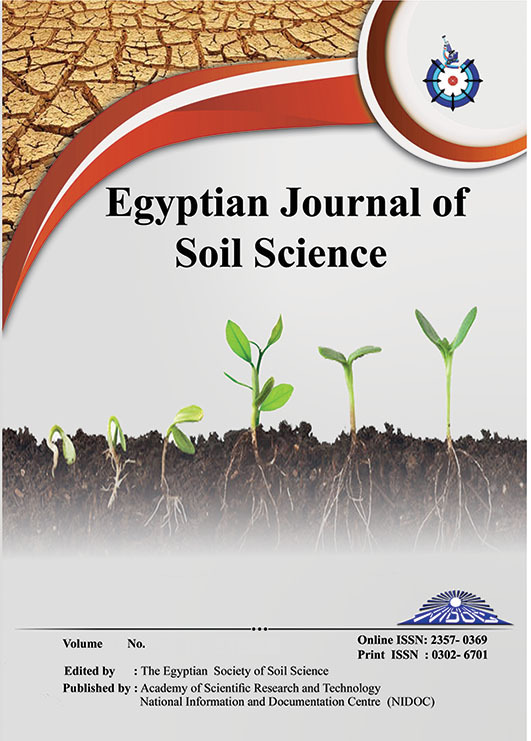 This experiment was carried out during the winter season of 2015, at a private farm in East Owainat area, New valley Governorate, Egypt, to study the effect of magnetic field levels (0, 2000, 4000 Gauas) and applied irrigation water regimes (IR100%, IR90%, IR80% and IR70%) under surface (SDI) and sub- surface drip (SSDI) on marketable yield, plant quality parameters, water use efficacy (WUE), irrigation water use efficiency (IWUE) and yield response factor (Ky) of lettuce (Lactuca Sativa L.) and potato (Solanum Tuberosum L.) crops. The experimental design was a split-split plot design with three replicates. The obtained results indicated that, the values of physical analyses of irrigation water were decreased with increasing MF levels except solubility. While, the values of chemical analyses of IR increased with increasing MF levels except SAR. Meanwhile, the values of (Na+, K+, CL- and HCO3-) were recorded non significant at different MF levels. Also, the results revealed that the values of quality parameters for lettuce plant and potato tubers increased with increasing both MF levels and IR under SDI and SSDI except total sugar TS for plant lettuce. The values of lettuce and potato Ya under (MF= 4000 Gauss, IR=100% and SSDI) treatment increased significantly by about 40 and 34 % compared to those under control treatment (MF= 0 Gauss, IR=100% and SDI). Moreover, the maximum values of WUE and IWUE for lettuce plant were 7.08 and 3.88 kg m-3 respectively, under MF= 4000 Gauss, IR=80% and SSDI treatment. While, the maximum values of WUE and IWUE for potato tubers were 11.28 and 5.89 kg m-3 , respectively, under MF= 4000 Gauss, IR=80% and SSDI treatment. This study shows that utilization of magnetized water technology may be considered a promising technique to improve both crops yield productivity and save irrigation water.